I saw 7 readings/concerts at this year’s Page-to-Stage Festival and my favorite was Andrew Simpson’s opera The Outcasts of Poker Flat. Filled with gorgeous arias/songs – the audience applauded loudly all through the presentation and cheered when it was over. I adored the beautiful “Wings of a Dove” and “The Tiny Mountain Chickadee”- two of the most beautiful songs I have ever heard. After the program was over, I immediately went over to Andrew to congratulate him and his fantastic cast which was filled with exceptional singers. I wanted to know when he was going to record those beautiful songs/arias. I hope it’s soon. 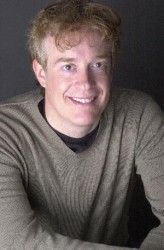 Composer Andrew Earle Simpson. Photograph by John Armato. Joel: How did your opera get selected to be in the Page-to-Stage Festival? Andrew: The Kennedy Center chooses the participants; we applied to participate under the rubric of Catholic University. When was the first time you read Bret Harte’s short story The Outcasts of Poker Flat and how long after that did you go back and decide that it would be fun to adapt it into an opera? I think I first read it in high school, but it wasn’t until a few years ago that I revisited it and felt that it would make a good opera. 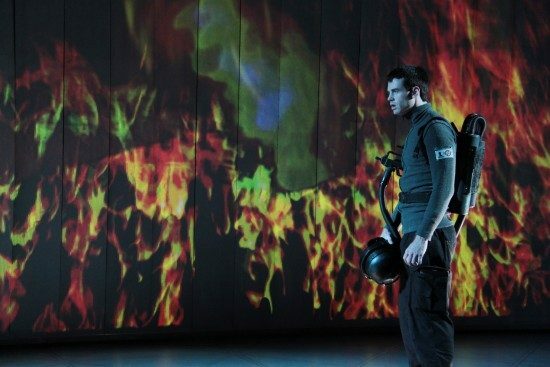 Why did you feel that this short story would make a great opera? First of all, it’s an interesting story with real emotional center: a group of undesirable (or, more likely, just unfortunate) people are thrown out of the mining camp of Poker Flat and left to fend for themselves. Trapped in a blizzard, the six characters react in different ways, and the ways in which they react – from noble to dastardly – reveal their personalities. The size of the ensemble – six – is manageable, split equally between male and female roles. The characters types invite a range of voices: 2 sopranos, 1 mezzo, 1 tenor, 1 baritone, 1 bass-baritone. The events take place mostly in a confined space, so it’s comparatively simple to stage. And, the characters undergo a transformation, so there is emotional growth. One character makes a supremely noble act of self-sacrifice even as another commits an incredible outrage against the group, which essentially strands them. How long did it take you to write the section we heard at Page-to-Stage? I wrote the entire work during the 2009-10 season, and several months to write this portion. What is the story of your opera? California, November 1850. Men came here by the thousands to find gold. Mining camps such as Poker Flat sprang up all over the Sierra Nevada Mountains. Once those men were there, they soon realized that they couldn’t just pan for gold all the time. And so hundreds of women were brought in. One night, a robbery took place in Poker Flat: two prominent citizens were killed. The leaders of the town took justice into their own hands and hanged the robbers. While they were at it, they took the opportunity to cast out a few other undesirable characters. The outcasts, making their way to Sandy Bar, encounter a young couple coming the other way: Tom Simson, a prospector, and his fiancee, Piney Woods. They are going toward Poker Flat to be married. It is now too late in the day for either group to reach its destination before dark, and so they decide to camp for the night in an abandoned shed by the roadside. Piney and Tom share a few moments together before bedding down – separately. Over night, heavy snow falls. The party wakes to discover that one of their number has stolen their horses, stranding them in the wilderness. Fortunately, young Tom has brought provisions which he shares with the group. Night after night goes by, and snow keeps falling. The outcasts seek entertainment by telling stories or singing. Cassie, one of the young women, was a showgirl at the Temperance House Saloon in Poker Flat. She also worked above the stairs, as they say. Asked to tell her story, she does, by way of one of her floor show tunes. Another week goes by, with more snow fallng each day. The party’s prospects for escape seem ever dimmer, as the snow traps them more deeply. The rough edges of the outcasts start to smooth out as their suffering increases. One night, Lori is alone at the fire after the others have gone to sleep. She looks back on her life with regret. Then she remebers her brief time in a Catholic convent school, and makes an important decision. Tell us about the songs we heard and the cast members who sang them. “March of the Grotesques“: ensemble number busy texture, with diverse and angular lines (they’re angry). Rachel Evangeline Barham (Cassie), James (playing two characters for this reading, Uncle Billy and Oakhurst) and Jessi Baden (Lori) – all of them have tremendously powerful voices and bring a tremendous drama and personal commitment to whatever they sing..
“The Tiny Mountain Chickadee”: duet for soprano and tenor…folk/country style, gentle and lyrical. Deborah Sternberg (Piney) and Noah Mlotek (Tom)…both of their voices are just right for these “young, innocent” characters…Deborah’s soprano is pure, clear, and beautiful – Noah’s voice has the fine tinge of youth and brightness. “Saloon Song”: solo soprano and ensemble…a raucous and somewhat blue “floor show” song. “Wings of a Dove”: 2 sopranos and mezzo-soprano…country/folk style, very lyrical, with intertwining lines for three voices. “It’s Snowin’ Again”: Lori (sung by Jessi Baden) comes to believe that none of them are not going to survive their ordeal, as the snow keeps falling. She looks back over her life regretfully – she’ll never have her dream of opening a milliner’s shop – she’ll only be a whore. Then she remembers something the sisters told the students in her brief time ina Catholic convent school: a person could redeem his life with good works – even one goof work. Lori then thinks of her good work, and makes the decision to sacrifice her life for another’s sake (Piney). “Lori’s Sacrifice”: gentle and quiet, a death scene for mezzo, baritone, and soprano. Jessi (Lori) is powerful but also tender in this death scene…James is appropriately stunned and supportive, and Rachel brings sympathetic warmth. James is perfect in this cynical number of a hard-edged gambler who has reached the end of his luck. Have you worked with your cast members before? Yes. I have collaborated with all of these wonderful singers before, in operatic and/or concert settings. Jessi and James have played leading roles in my operas on Greek Tragedy: Agamemnon, The Libation Bearers, and The Furies, and Deborah and I have performed together in recital. Noah is a singer (as is Deborah) in Cantate Chamber Singers, an exceptionally fine chorus under the musical directorship of Gisele Becker, and we’ve performed many, many concerts together. 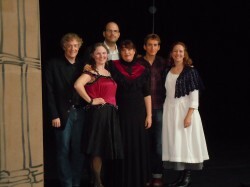 L to R: Composer Andrew Earle Simpson, Rachel Evangeline Barham, James Rogers, Jessi Baden, Noah Mlotek, Deborah Sternberg . Photo by Carlos Mendoza. 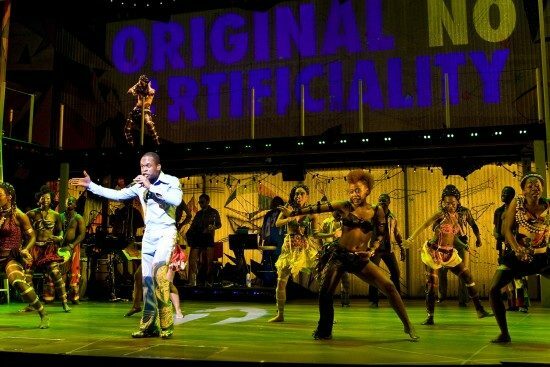 What liberties and changes did you take and make from the original short story for your opera? Why you think the new changes work better for opera? The basic outlines of the story are intact, but I have chosen to make the curve of the story one about redemption through suffering (which only partly happens in the story). The ending of my story is different, but that’s a secret which will have to wait for the full premiere! I changed some of the names of the characters and added some scenes, such as the “Saloon Song,” in which Cassie tells her story, or an ensemble number in which the characters find some whiskey and then engage in colorful insults of the Poker Flatters who threw them out. I played up a love interest between Oakhurst and Cassie (never stated, but gently hinted at in Harte’s story) Generally, I wanted to emphasize the humanity of these characters – not to have them be stereotypes or caricatures – and to make their misadventure of being trapped in a blizzard pay an emotional dividends. All of them were unfortunate in some way before the story began, and that informs their experience. Well, all of them! I’m particularly struck by the opening ensemble piece, the “The Tiny Mountain Chickadee” duet, “Wings of a Dove,”and the final number, James’ solo. Those were also my favorites. I am hoping you will record the opera because the score was beautiful – especially “The Tiny Mountain Chickadee” and “Wings of a Dove.” Are you considering recording it? We are making an archival recording this weekend, but yes, I would like to make a commercial recording when the work is finished. I want to have the full ensemble present as well as a violin, bass, guitar, mandolin, banjo, out-of-tune (really out-of-tune) piano, and percussion. Is the rest of the opera already written? What do you foresee down the road for your outcasts? It is written, although places need to be fleshed out and completed. Right now we’re looking at a summer 2012 Fringe Festival production, so stay tuned. On the business card you gave me it says you are an ‘Ordinary Professor.’ How ordinary are you? How long have you been teaching Theory and Composition at The Benjamin T. Rome School of Music at The Catholic University of America? Why do you enjoy teaching there? I have great freedom to pursue my creative projects, and have always had excellent, amazing support there. And, the students and colleagues are fantastic. Where did you receive your musical training? Doctor of Music from Indiana University, Master of Music from Boston University, and Bachelor of Music from Butler University. What would you say to young musicians and playwrights and composers and singers and actors who are considering attending CU and the The Benjamin T. Rome School of Music? We have a Master’s program in composing for the stage (Andrew Morrissey, the other work on our slot, is a 2nd-year student in the program), and we support projects in musical theater, opera, dance, and drama. We work with a very strong Department of Drama at CUA, and our composers get solid professional and academic training and much production experience (they need to produce their thesis works, for example). And, opportunities such as the Page-to-Stage Festival are also great ways to have their works and works-in-progress performed before knowledgable and interested audiences. That last thing – tryouts before a live audience – is just about the best training these composers can have. Listen to clips of Andrew’s work. Read more about The Benjamin T. Rome School of Music.